While there are a variety of surgical aesthetic enhancement options that can help new moms improve their skin, renew contours, and generally restore their pre-pregnancy figures, there are also non-surgical treatments that can provide effective cosmetic rejuvenation and help women feel better about the way they look. The fact is, the stresses of motherhood can have a significant affect on the skin, causing lines and wrinkles to appear prematurely and perhaps making you look older than you really are. As part of your mommy makeover, Dr. Tom Lintner can address premature signs of aging in the face with non-surgical treatments designed to smooth out the skin and give you a more youthful and refreshed appearance. 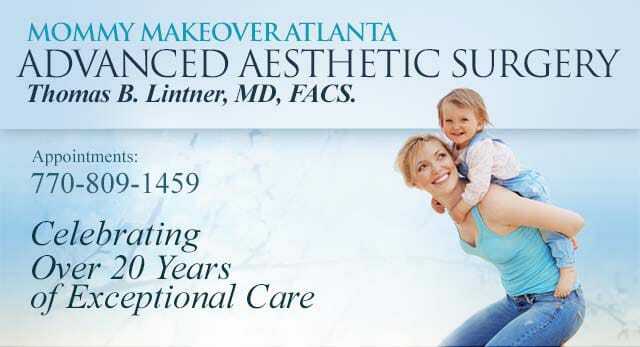 Please contact Dr. Lintner to schedule a mommy makeover consultation. We can help you renew your appearance with non-surgical facial enhancement options. Wrinkles and fine lines appearing along the face are common occurrences after pregnancy. New mothers can often be affected by premature signs of aging such as wrinkles and creases, loss of volume in facial features, and other conditions. Dr. Lintner offers a number of injectable cosmetic treatments that can significantly rejuvenate your facial appearance without the need to undergo surgery. Popular treatments such as BOTOX® Cosmetic can smooth out lines and wrinkles along the forehead, between the eyebrows, and other areas. Plus, injectable dermal fillers like Restylane® and Juvederm® can help augment facial features such as the lips and cheeks, giving them a fuller, more contoured appearance. Another option is fat transfers to areas of the face like the nasolabial folds (the parentheses around the mouth). Dr. Lintner partners with a professional skin care expert to help you develop a customized, effective at-home skin care regimen. Our aestheticians recommend only the most advanced medical-grade skin care products to renew areas of the skin affected by wrinkles, fine lines, and poor elasticity. Many of our products can not only rejuvenate the skin’s outer layers, but also work to stimulate the growth of healthy skin cells underneath, ultimately helping the skin to replenish itself with beautiful results. In our Marietta office, we have not only the IPL laser treatment for red spots, brown spots and sun damage; we also have laser hair removal safe for women of all skin colors as well as the Exilis radio-frequency skin treatment which not only tightens skin in all areas of the body but can improve very small localized areas of fat. In our Woodstock location, we are able to provide permanent make-up for those busy moms who still want to look their best, but do not have extra time for make up application. In addition to non-surgical procedures, Dr. Lintner is known for the achieving natural results through various surgical procedures. To learn more, please follow the links below to our sister website, www.tomlintnermd.com.